U.S. Medical Marijuana Market size was valued over USD 3.5 billion in 2017 and is expected to witness more than 13% CAGR from 2018 to 2024. As of 2018, the application of marijuana for medical purposes has been legalized in 31 U.S. states. The increasing use of marijuana for treatment of a range of medical conditions such as neurology, cancer, HIV/AIDS, seizures, muscle spasms, and nausea will boost the market growth. In addition, majority of the U.S. population are in favor of using marijuana for medical applications, due to which various states have now passed medical marijuana laws. Growing prevalence of pain in the America is driving the U.S. medical marijuana market. As per the National Health Interview Survey (NHIS), approximately 25 million people suffer from pain each day in the U.S. Furthermore, increased research on marijuana's potential for medicinal use is also gaining momentum in the U.S., thereby enhancing the market growth during the forecast period. Certain obstacles such as side effects associated with medical marijuana and strict regulatory norms will hinder the U.S. medical marijuana market size expansion. Also, difficulty in undertaking medical marijuana business banking will also restrict the market growth in the U.S. 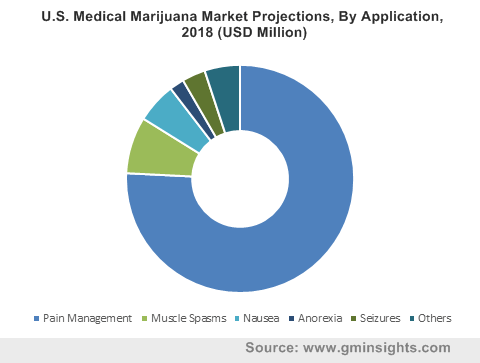 The U.S. medical marijuana pain management market held around 75% share of total application market valuation, accounting for a total value of USD 2,691.9 million 2017. Growth is attributed to the increased prevalence of pain-related issues and conditions. According to various research studies in the U.S., 1 in 10 adults suffer from chronic pain each year, which in turn has augmented the application of medical marijuana. The U.S. medical marijuana market for skin-related conditions such as eczema and psoriasis, is forecasted to grow at a very impressive rate of 13.7%. Marijuana has anti-itch, anti-microbial and anti-inflammatory properties, that accelerates the treatment of skin disorders. In addition, marijuana is a better treatment option as compared to other steroid creams which has few side effects including rosacea, thinning of skin, increased blood pressure and blood sugar levels. The U.S. medical marijuana inhalation market segment accounted for USD 2,615.1.0 million 2017. Inhalation route of administration enables controlled dosage and effective absorption of cannabinoids into the body, hence increasing its preference as compared to other options. Vaping of medical marijuana results in maximum absorption of the product into the body, hence maximizing the therapeutic effects. Topical medical marijuana market is estimated to grow at a CAGR of 14.3% during the forecast period in the U.S. Increased demand for marijuana topical products for the treatment of various skin diseases including eczema and psoriasis will result in the market growth. According to researchers at the University of Colorado, cannabinoid is beneficial for the treatment of skin conditions and can successfully be used as a natural alternative to commonly-used steroids, thus driving the market growth. The U.S. medical marijuana dispensaries market segment generated value of USD 2,144.3 million in 2017. Increasing incidence of pain cases in the U.S. coupled with growing demand for medical marijuana is driving the segment growth. Moreover, dispensaries are authorized bodies abiding by the local government rules, hence maximizing the sales of marijuana through dispensaries. U.S. online medical marijuana will expand at a remarkable growth rate of 13.9% during 2018-2024. Online medical marijuana stores offer increased convenience and easy-to-use format that makes the complete buying process quite comfortable. With more and more medical marijuana approvals, the market for online distribution channel will only to continue to grow. 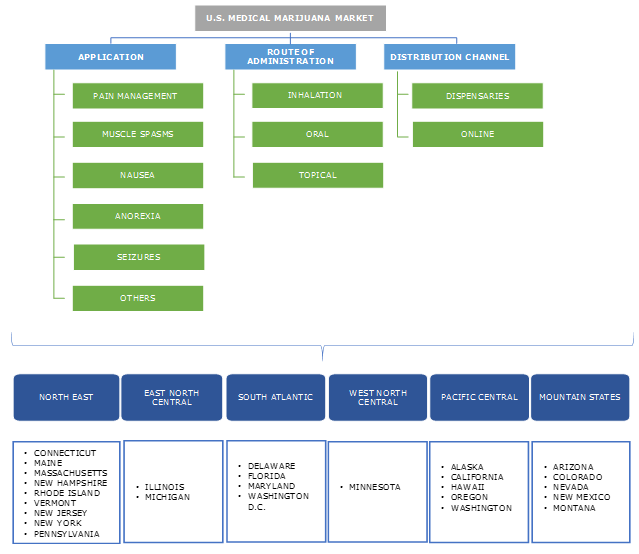 Pacific Central medical marijuana market was valued at USS 2,085.9 million in 2017. Presence of states such as California, Washington and Alaska and increased application of medical marijuana is driving the market growth in the region. California led the U.S. in legalization of medical marijuana since 1996. Moreover, majority of medical patients reside in California with more than 261 dispensaries, hence adding up to the revenue of Pacific Central medical marijuana market. North East medical marijuana market is estimated to expand at 15.6% CAGR during the forecast period. Number of states from the North East zone of U.S. have been legalizing the therapeutic application of marijuana. It is expected that with each passing year, majority of the states in North East zone will pass medical marijuana laws, facilitating the application of marijuana for the treatment of various chronic conditions. Hence, North East region of the U.S. is expected to grow tremendously, thereby resulting in industry expansion. Some of the leading key players in the U.S. medical marijuana market include Canopy Growth, Aurora Cannabis, Inc., Medical Marijuana, Inc., GW Pharmaceuticals, Aphria, Inc., Tilray, Emerald Health Therapeutics, and United Cannabis. Strategic initiatives such as mergers, partnerships and acquisitions undertaken by these companies will increase their geographic reach, and product portfolio, hence assisting in gaining competitive advantage. For instance, in 2016, Canopy Growth Corporation acquired Spectrum Cannabis Chile SpA, to focus and expand in the emerging Latin American medical marijuana market. The aim of this acquisition was expansion of Canopy Growth Corporation in the Latin America region with a strong footprint and growth potential. As of 2018, there are 30 states and Washington D.C. authorized to use medical marijuana for the treatment of chronic pain conditions, seizures, muscle spasms, nausea and others. With coming years, U.S. is expected to be one of the largest markets for medical marijuana industry. Majority of U.S. states are in favour of legalization of marijuana for medicinal applications due to its strong therapeutic efficacy with minimum side-effects associated. After the recent approval of medical marijuana use in Oklahoma through ballot initiative, the legalization of medical marijuana is on the ballot in several other U.S. states in 2019.